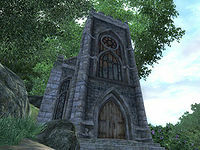 Cadlew Chapel is a defiled chapel east of Bravil containing necromancers. It is located on the north bank of the Silverfish River, near the estuary, directly across the river from the Ayleid ruin of Nenalata. The sanctuary has been desecrated by necromancers; two of them can be found here, as well as a dead treasure hunter lying on a bloodstained table, a couple of inanimate zombies, and a corpse hanging above the altar. A chest and a pair of rugged pants can be found near the dead treasure hunter's body. On the small bloodstained table in front of the altar, amidst several severed limbs, are two human hearts. Near the door on the right side there is a wooden ladder leading to a small cupola on top of the chapel. This contains a skeleton and a locked chest. The cupola also offers an amazing view, and the city of Bravil can be seen across the water. A Nirnroot can be found outside, just left of the entrance door. The chapel's altar is still functional but cannot be used due to two severed arms, which cannot be moved and block the blessing from reaching you. Therefore, if you activate the altar you will see the standard message (Rejoice! Through faith, your afflictions are banished! ), but the blessing will actually have no effect on your character. Esta página foi modificada pela última vez à(s) 15h08min de 3 de janeiro de 2015.